We had a very busy week! I started a time inventory last Sunday so I’ve been unusually productive because of keeping those records, particularly at work. It seems I spend a lot of time. I had a good meeting with my advisor this week – he’s been out of town most of the summer so we haven’t communicated much – as well as a great meeting with some of our collaborators and I’m feeling very encouraged. On Monday night I met with my first clients through my church’s financial ministry. I didn’t run the meeting as well as I would have liked – it felt rather disorganized – but I said a few things that they seemed to latch onto so I hope those insights will help them. 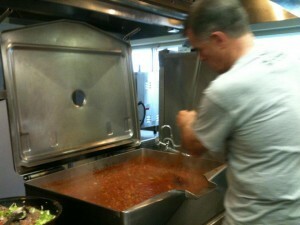 On Thursday evening Kyle and I cooked and served dinner at a local homeless shelter/food pantry. It was pretty wild to see this enormous vat of chili come together – the person manning it stirred it with what basically looked like an oar! Between those activities, small group, and Kyle’s IM basketball and volleyball games, we were busy every night this week and sometimes double-booked, so we have been taking the weekend easy! G.E. Miller from 20 Something Finance wrote a wonderful monologue on the development and demise of lifestyle inflation – you don’t want to let yourself get to the end of this play! Miss T. from Prairie Eco Thrifter wrote a great overview of the simple financial choices you can make to grow wealth. Corey from 20’s Finances listed the many excuses people give for why they can’t save money, but emphasized that even saving small amounts can be impactful. Nathan from Real Sustainable Habits argued at Sustainable Life Blog why working out at home instead of having a gym membership saves both time and money. It’s a very detailed post so definitely check it out if you’re interested in workout options. Lance from Money Life and More summarized at Young Cheap Living all the things that college graduates shouldn’t change about their lifestyles once they’re pulling in paychecks. Rich from Christian Personal Finance shared the reasons why he talks about money as a pastor and several shocking statistics about how little American Christians give. The median annual giving for an American Christian is $200 and only 4% tithe! This puts the discussion we had earlier in the week in a larger context. Michelle from Making Sense of Cents finally has her MBA!! Congratulations, Michelle! Edward Antrobus included Found Money Creates Wants in the places he’s been. Funny About Money listed Found Money Creates Wants in his Blue Danube Dance. Sweating the Big Stuff featured When to Start Saving for a Mid-Term Goal in his best of the rest. Modest Money named Giving Should Exceed Saving? as one of his favorite blog posts. Work Save Live listed Giving Should Exceed Saving? in his great weekend reading. Why We’re Not Getting the Chase Sapphire Card Even Though It’s a Great Deal was featured in the Festival of Frugality. If I Were My Financial Advisor, What Would I Tell Me? was featured in the Carnival Of Financial Planning #248. When to Start Saving for a Mid-Term Goal was featured in the Carnival Of Financial Planning #248. Jeremy from Modest Money is hosting a cash and ebook giveaway to celebrate his 6-month blogging anniversary! This week’s top comment one because it gave me a huge chuckle as well as an idea for a new post! Kathleen from Frugal Portland asked if we are “going to be in the family way soon?” See July 2012 Month in Review: Money to see how the misunderstanding arose. 8 Responses to "Weekly Update 27"
That would be pretty interesting to see how a huge vat of chili like that comes together. The amount of food that goes into it must be incredible. Also it’s good to hear that your first financial meeting at your church went well. I don’t think the organization matters so much as whether they got something beneficial out of it. And thanks for the mention Emily. Enjoy the rest of your weekend. The recipe called for 50 lbs of ground beef alone! The last time we served there we made tacos so it was many different components and we didn’t see the full amount of food all together like with the chili. Some ladies got their small group to make a bunch of amazing desserts as well – I think they had about six different types of brownies and cake! Holy moly is that a lot of chili! That’s a real good thing to do with some extra time, though. Or even sacrificing your time that otherwise wouldn’t have been free. femmefrugality recently posted..Q: How Does Your Garden Grow? It turned out that Kyle had a conflict that night, actually, but since we don’t get opportunities very often to serve with this ministry we prioritized it. It was fun! That chili vat is huge. It looks yummy though. I love chili in the winter. I should share a great vegetarian chili recipe I have with you. Thanks a ton for the inclusion this week. I really appreciate it. I love chili all year round, but I make it more in the summer because we get ground pork sausage from our CSA which makes it wonderfully tasty and spicy. I pack it up and take it to work.